Everybody has a metric-spewing system, like StatsD, and a graphing system, like Graphite. 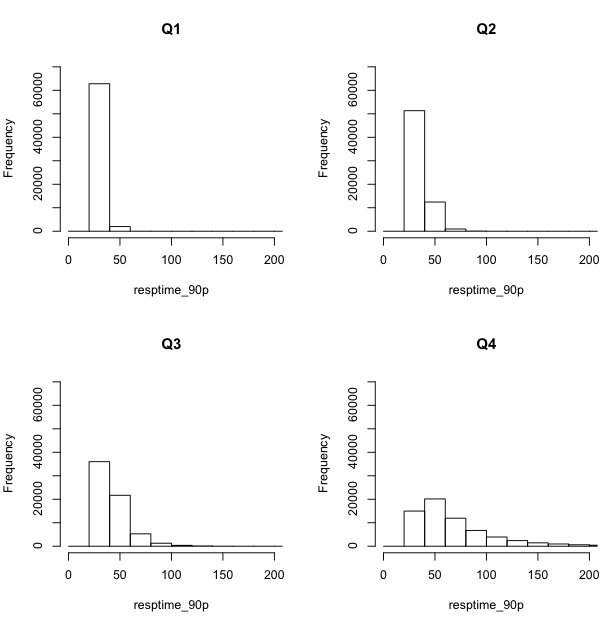 Graphite makes time-series plots. Time-series plots are great! But they’re not everything. When CPU usage rises, what happens to page load time? How many concurrent users does it take before we start seeing decreased clicks? What’s the relationship between cache hit rate and conversion rate? In each of these cases, we’re comparing (as Theo Schlossnagle is so fond of saying) a system metric to a business metric. A system metric is something like CPU usage, or logged-in users, or cache hit rate. A business metric is something that relates more directly to your bottom-line, like page load time, click rate, or conversion rate. As CPU usage gets higher, page load time generally increases, but not linearly. For a given CPU usage, there’s a line (yellow) below which page load time will not go. Time-parameterized plots like these are a great way to get to know your system. If you make an architectural change and you find that the shape of this plot has changed significantly, then you can learn a lot about the effect your change had. Configure a graphite instance to store every data point for the metrics in which you’re interested. Run a script to download the data and parameterize it with respect to time. The first thing we’re going to do is set up Graphite to store high-resolution data for the metrics we want to plot, going back 30 days. Sure I could, hypothetical question lady, but one nice thing about Graphite is its suite of built-in data transformation functions. If I wanted, for example, to make a parameterized plot of the sum of some metric gathered from multiple sources, I could just use Graphite’s SUM() function, rather than having to go and find the matching data points and add them all up myself. This basically says: keep every data point for 30 days for stats.gauges.nconn (number of concurrent connections) and stats.timers.resptime (response times of API requests), and discard everything else. 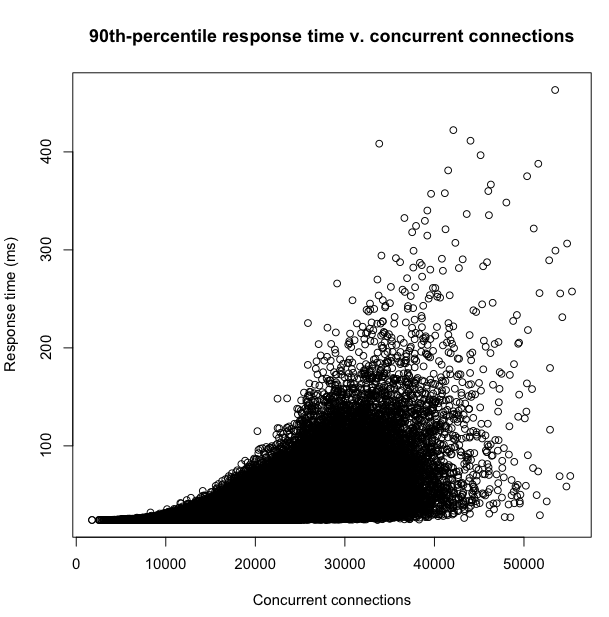 This shows us pretty intuitively how response time splays out as the number of concurrent connections rises.